It’s simple – if your client is on the job as an employee and he or she gets injured, your client is entitled to workers’ compensation benefits. (Lab. Code, § 3600.) In most instances, the law of the land makes workers’ compensation an injured worker’s sole and exclusive remedy. However, if another person or entity caused the worker’s injury, you may have a viable third-party claim. If no one other than the employer is responsible for the injury and an exception to the exclusive remedy rule applies, you may be able to sue the employer in civil court. Where the employer has no fault in causing the harms and losses suffered by an injured employee, the employer and their workers’ compensation carrier enjoy the right to recoup workers’ compensation benefits paid in the event the injured worker recovers from a third-party defendant. The right to recovery may come in the form of a lien claimant, a plaintiff in intervention, or as a petition for credit before the WCAB for an offset against further benefits. However, where the employer is arguably at fault for some, or a substantial share of fault, they may (in full or in part) lose their right to subrogation. Note: Failure to properly place the employer on notice of your third-party action may later reduce your ability to negotiate the workers’ compensation lien they will eventually assert, as it may prevent an assertion under common fund principles, as later discussed herein. Tip: When placing the employer/WC carrier on notice of the claim, seek their participation and active involvement by giving them a list of everything you need in writing, such as copies of all medical and billing records, employment file, wage records of the employee, investigation reports concerning the incident, etc. The employer/WC carrier will rarely oblige and this will strengthen your future argument in support of a common fund reduction to their recovery rights. Any employer who pays, or becomes obligated to pay compensation, or who pays, or becomes obligated to pay salary in lieu of compensation, or who pays or becomes obligated to pay an amount to the Department of Industrial Relations pursuant to section 4706.5, may likewise make a claim or bring an action against the third person. In the latter event, the employer may recover in the same suit, in addition to the total amount of compensation, damages for which he or she was liable including all salary, wage, pension, or other emolument paid to the employee or to his or her dependents. Labor Code section 3850, subdivision (b) provides that the term “employer” includes the actual employer or the employer’s workers’ compensation insurer. What can their lien include? Tip: Audit the WC lien! You must request/demand the “Itemized Printout of Benefits” from the Workers’ Compensation carrier and assess every penny they claim to have spent on the claim to reach the alleged “total lien amount.” All workers’ compensation carriers and attorneys are familiar with this since, pursuant to California Code of Regulation, Title 8, section 10607, workers’ comp attorneys demand an itemized printout routinely. Permanent disability where there has not yet been an award or certainty as to the amount of the future payment. If permanent disability has already been paid, which is often the case in the form of an advance or permanent disability advance (PDA), then permanent disability payments may be part of the lien. Legal costs, defense attorney fees, other expenses such as copy service and investigation (e.g., sub-rosa). Case management that is a collaborative process of a medical assessment, bill audit, medical treatment reasonableness determination, utilization review. Although this process is now mandated by California law under Labor Code section 4610, you should argue that this process is not a benefit or payment conferred on an injured employee. While California law may support reimbursement of such expenses, in many cases the WC carrier abuses the process to wrongfully deny the employee benefits. Remember that these are not treating physicians, they are experts, similar to an IME. Under current WC law these doctors cannot dictate medical treatment. In most situations they are used when the employee or applicant disagree on the PTP’s report and findings. Plaintiffs, in many instances, finds themselves in a worse situation following these exams as their primary physicians are often more liberal to the plaintiffs’ cause. Again, you should argue that this process is not a benefit or payment conferred on an injured employee and it is certainly not medical treatment. Tip: In a case with a favorable QME/AME, particularly where the WC attorney helped the third-party case with these experts, don’t try to argue against the QME/AME’s costs. In many instances you may even be able to work with the subrogation attorney in getting your client to a favorable QME/AME to help build your third-party claim. We often take QME/AME’s depositions at the WC carrier’s expense. Sometimes, we see extensive AME/QME costs that can really drive up the lien, which pressures the third-party defendant into settlement. While most subrogation attorneys make assertions without any legal support, we do see the occasional good argument. We have seen an argument based on a “cost of mitigation” effort. One Court of Appeal decision does allow plaintiffs to recover the cost of mitigation efforts as a recoverable item of damages. (Kleinclause v. Marin Realty Co., (1994) 94 Cal.App.2d 733. )My takeaway is: Argue against this theory in your work comp subrogation negotiations, and argue for it in your third-party negotiations. Note: When the subrogation attorney for the employer/WC carrier argues to recover costs or expenses beyond the basic indemnity and medical benefit payments, ask them for legal authority in support of their position. Put the burden on them. The odds are they won’t be able to provide you with any authority and you’ll be able to effectively argue down the lien. In basic form, the lien constitutes the reimbursement rights of the employer based on benefits paid to the employee up to the time you satisfy the lien. Credit, on the contrary, represents the employer’s right to halt any further benefits by the employer to the employee until the employee has exhausted his net proceeds of any third-party settlement or award. An employer is entitled to claim a credit against future compensation benefits which may be payable to the employee to the extent of the employee’s net recovery from the third party. (Lab. Code, § 3861.) However, if the employer’s concurrent negligence contributes to the employee’s injury, its credit rights may be reduced or defeated depending on the extent of its negligence. (Associated Construction and Engineering Company v. WCAB (1979) 22 Cal.3d 829.) Credit applies to any benefit of compensation including indemnity, medical treatment, lien claims, attorney’s fees, voucher, med-legal cost, and even penalties. This is likely the case in at least 50 percent of your third-party cases since most WC cases take even longer to resolve than civil cases. Likewise, WC seems to delay settlement when they know a third-party settlement is down the road that will potentially relieve them from further payments. This settles all issues and gives lifetime medical benefits. Client may receive indemnity and/or pension payments every other week, possibly for life. Same concept as a Stipulation but after a finding of fact by the trial court. The claim is 100 percent closed and money paid out in lump sum. You need to know at what stage the WC claim is in and understand its ramifications when you settle the third party. If the WC claim is open and ongoing when you settle the third party, the WC attorney will likely not be paid for any work he has done on the case including litigation cost he has expended. 1) The employer may file suit in his or her own name under Labor Code section 3852. Even if the employer has not paid any benefits, he or she may still file a lawsuit in anticipation of future benefits. 3) The employer may intervene into an existing action brought by the plaintiff/employee pursuant to Labor Code section 3853, which provides for intervention any time before trial. (See also Mar v. Sakti International Corp. (1992) 9 Cal.App.4th 1780.) If the employer intervenes in the action, it is a party and all of the defenses that the third-party defendant has against the employee/plaintiff are also available against the intervener. (Hubbard v. Bolt (1983) 140 Cal.App.3d 882).The right to intervene into an existing action is also available to the injured worker. Tip: If the employer timely files their lawsuit against the third-party defendant and the plaintiff misses the SOL, the plaintiff can still intervene into the employer’s action and will not be barred by an SOL defense. For instance, if the employer lien is $150,000 and the employer intervenes and aggressively fights for reimbursement and is eventually awarded $150,000, any claim for cost and attorney’s fees by the firm representing the employer comes out of that same $150,000 and not from any other source. The issue is based on whether the employer had “active participation” or “passive participation.” If the employer is merely a lien claimant, you can argue they are a passive participant and common fund principles apply. If the employer intervenes and has “actively participated,” then the common fund doctrine or equitable apportionment is not allowed. (See Kavahaugh v. Sunnyvale (1991) 233 Cal.App.3d 903). However, just because the employer intervenes does not automatically make their participation active. The intervener has the burden of proof and, in more instances than not, they are passive beneficiaries. The trier of fact for “active versus passive” participation is the trial court and the courts are in disagreement to some degree as to whether you can apportion the level of active participation in calculation of attorney’s fees under a common fund theory. Some claims, such as a wife or husband’s claim for loss of consortium, are not subject to the employer’s claim for credit. (Gapusan v. Jay (1998) 66 Cal.App.4th 734.) Use with caution, as in every third-party case where you have a spouse, you have the ability to make a loss of consortium claim and specifically assign a portion of the settlement to the spouse. When WC comes asking for the net recovery to the plaintiff/employee, you need only give the net recovery to him/her and not include the amount assigned to the loss of consortium claim for the spouse. Be fair and reasonable. The courts have the power and authority to re-allocate funds if it appears this was done to unfairly circumvent the employer’s right to credit. Assume the following: The employer filed a notice of lien in the amount of $150,000, which constitutes all the benefits paid to that point. The employer does not participate in the fight. In the third-party case you recover $450,000 in settlement. Assume litigation costs are $50,000 and fees are $180,000 (40 percent); the remaining balance would be $220,000. ($450k-$50k-$180k=$220k.) In such a scenario, you should argue that the work comp lien is subject to a 40 percent reduction for fees and a pro-rata share in the cost, in this case one-third of $50,000, or $16,666.Hence, their lien would be reduced first by the fees of $60,000, followed by the cost of $16,666, and they would be paid $73,334 on their $150,000 lien. The plaintiff would pocket $146,660 from $450,000, which would be subject to employer credit rights in the event the WC case was still open. The above illustration is the argument supported by law; however, in practice we see the employer is more likely to agree to a 33.3 percent to 40 percent reduction for fees and no reduction in cost. It is all open to negotiation, so make your case. Assume the same $450,000 settlement, the same $50,000 in cost and same fees at $180,000, but this time the employer has actively participated in the litigation sufficient to meet their burden. They would be entitled to their full lien value of $150,000, which would leave a balance of $70,000 for the plaintiff, which would still be subject to credit. As discussed above, unless the employer has acted as a true party to the litigation, noticed deposition and examined witnesses, served and answered discovery, do not let them extort your client by claiming they are active participants and therefore the common fund does not apply. Assume you had the same $150,000 in employer paid benefits and your third party only had a $100,000 policy limit which was tendered. In this scenario, it really doesn’t make a difference what level of participation the employer had. You would recover your attorneys’ fees and your cost first and the balance would then go to the lien. The plaintiff recovers nothing from the third party. This is almost always the situation in high WC lien cases and low third-party policy limits. Note: In these situations, work closely with the WC attorney representing your client. In our experience, when the employer is being paid back a substantial sum of money, we are often able to obtain a more favorable WC settlement for the client. Thus, not all is lost. Employer fault can be used to decrease or defeat the workers’ compensation lien and credit rights. Timing is everything. During discovery the employer can prove to be a powerful ally and cooperate in providing witnesses, documents and more. Raising issues of employer’s negligence too early can impair this alliance and give the third-party defendant ammunition to push for a lower settlement. A case-by-case analysis must be done. Assume settlement of $1 million where employer fault was alleged. Assume work comp paid $150,000 in benefits. Assume employer was an estimated 30 percent at fault and third-party defendant at 70 percent. Plaintiff receives $1 million less fees ($400,000) and costs; assume $500,000 in plaintiff’s pocket. Employer fault at 30 percent amounts to a “threshold” number of $300,000. This means that their lien does not get paid and WC must provide additional benefits up to an additional $150,000 until they get a right to their credit. Once WC has paid $300,000 in benefits, they will have the right to petition the WCAB for a credit based on the $500,000 plaintiff recovered. You will need to work with the WC attorney and respond/object to any petition for credit where employer negligence is alleged. Same as scenario one, but $1 million by verdict with the same fault allocation. Because there was no settlement, defendants can raise a “Witt v. Jackson” post-trial motion to reduce the judgment by the amount the workers’ compensation benefits paid. Hence, no double recovery. Thus, a $1 million recovery will be reduced to $850,000 after deduction of work comp benefits paid. WC will not be paid their lien and will have to pay an additional $150,000 in benefits before they can assert a credit. After deduction of attorney’s fees and costs (same as above), the plaintiff in this case nets $150,000 less in his pocket. Note: When you have significant employer fault and you compare the same gross outcome before trial and after verdict, your client may be better served with a settlement. The third-party defendant runs the risk they will not be able to shift liability to the employer which should result in a larger pre-trial settlement. Likewise, when you have facts pointing to employer negligence, you carry all the cards in negotiating the WC lien. These cases are prime for mediation. The third-party defendant may raise employer fault as an affirmative defense in its answer to the complaint. However, the court in C.J.L. Construction, Inc. v. Universal Plumbing (1993) 18 Cal.App.4th 376, held that an employer may not be compelled to participate in litigation based solely on a Witt v. Jackson. The case of Brandon v. Santa Rita Technology Incorporated (1972) 25 Cal.App.3d 838, establishes that the issue of employer fault must be raised in a pleading filed and served on the employer or lien claimant in a timely manner. The Brandon case has been used successfully by plaintiffs in intervention to obtain motions precluding the introduction of evidence of employer negligence or fault at trial were the allegation has not been timely raised. We too can use this case to our advantage. An employee’s attempt to use Labor Code section 3859(b) will fail, and settlement proceeds will be subject to the employer’s lien, if the settlement includes workers’ compensation benefits that have been paid. (See Marruqo v. Hunt (1977) 71 Cal.App.3d 972). An employee has a statutory duty to notify the employer of any settlement with the third-party defendant. (Lab. Code, § 3860, subd. (a).) In order to avoid an employer’s claim that it did not receive notice, a plaintiff should give written notice with a proof of service in a similar fashion as the notice requirements set forth in Labor Code section 3853. The trial court’s ruling or a jury verdict on the issue of employer fault are binding on the employer. However, if employer’s negligence is not resolved in the third-party case, the WCAB acts as an alternative forum for resolution of the employer’s negligence. The trial court’s ruling or a jury verdict on the issue of employer fault are binding on the plaintiff in intervention. You may wish to settle with the third-party defendant and proceed forward in your civil case to trial essentially against the plaintiff in intervention on the sole issue of employer negligence. This is a rare instance where you can answer ready for trial without the defendant and put on your case to establish employer negligence. The trial court may prefer this to be conducted as a bench trial or evidentiary hearing during which the trial court judge will make the necessary ruling. 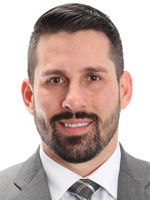 Adam J. Savin is a litigation and trial attorney at Savin Bursk Law whose focus is complex serious-injury cases – particularly third-party claims. Adam handles select workers’ compensation cases as well as personal-injury cases.